First off this story works best all together, I found it so much more enjoyable when re-read the whole thing in one go, as opposed to each section of the story as it trickled out month by month. While each issue in the series does have a definable individual plot they are not issues that stand up entirely on there own, unlike issues of Klingons: Blood Will Tell or Intelligence Gathering. Is that a bad thing? Not necessarily, the whole story together feels a bit bigger than IDW's other part-stories to-date because it's one story over 110 pages rather than a collection of little stories that stick together to tell a bigger one, so that one story feels much more fleshed out, more in-scale with a novel than the brief 22-page stories we're used to. But as a monthly series I found it a bit tedious, because each issue was entirely dependant on the rest of the series, and not at all self-contained it was forever "to be continued" with no real payoff until the last couple of issues. I don't think the story being split into five in any way benefited it. The next big thing about this series for me was that it's New Frontier, a rather separate entity that I have only a passing familiarity with (having read handful of stories that appeared in multi-series anthologies and gaining some familiarity due to being a frequent Memory Beta editor). I was concerned when this series began that I'd be jumping into the stories of a set of characters I don't really know, and the short format of the comic would not provide sufficient introduction for. Fortunately the series was so enjoyable written that wasn't an issue, while the characters were not introduced in great detail the information about them important to the story was emphasised early on so everything made sense. And in fact the series has encouraged me to catch up on New Frontier properly sooner rather than later. The story managed to feel impressively big for what boils down to "crazy admiral steals a starship" taking place on five starships, a starbase and a planet, with elements from the mirror universe thrown in on top! The side story on New Thallon felt a little separated from the rest of story and I don't really see what it added here, for the ongoing New Frontier series it adds what I presume is the start of a new story-arc in the form of a pregnancy but it's main purpose in the miniseries seemed to be to add an extra place for Morgan to hang out. Similarly the Trident seemed to be squashed in there for the sack of completion but didn't add a great deal. 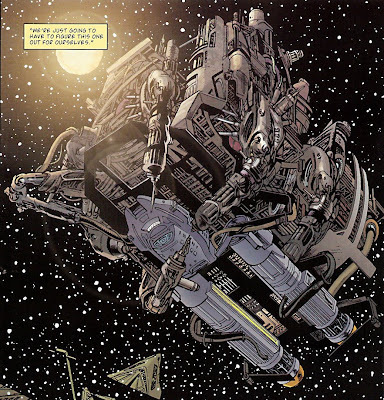 The Excalibur on the other hand was nicely used with plenty of fun characterisation, Calhoun and Kebron were particular enjoyable to read, but the whole crew dynamic on that ship is just fun and I'm glad the story had time to really play with that. 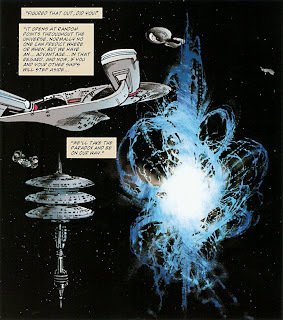 The story did leave a quite a lot of dangling threads, some, like the pregnancy, are obviously quite long term, but some were disappointing not to have been resolved in the series, the fate of Morgan and who/what from the regular universe was allied with the mirror universe people. I assume all will be continued in future New Frontier stories, but the mirror universe plot from this story seemed quite neatly concluded so it feels odd to leave that one specific unresolved plot point. 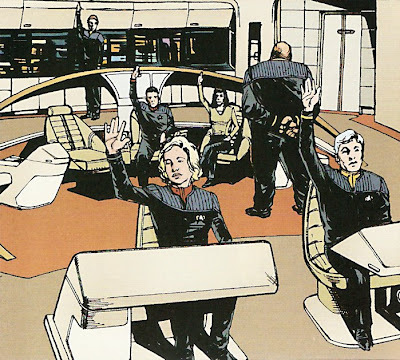 The art throughout the series is superb, some of best to come out of IDW for Star Trek comics to date I think. It has a really high quality feeling, it looks like a lot of work has gone into it and is constantly visually engaging. I would eagerly anticipate any more art from Stephen Thompson. 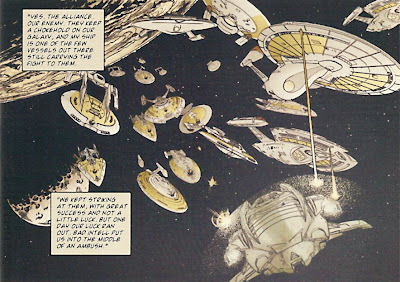 My only problem with the art - page 7 of issue 5, in which while explaining the political situation in the mirror universe a fleet of Alliance starship is depicted as a fleet of 24th century-Starfleet ships with Terran Empire paintwork! If that was intentional it needed an explanation, and if it was an error I'm amazed it got through the editorial and CBS approval processes. All in all the series was fun, was mostly accessible to new New Frontier readers and I'd imagine great fun for more familiar readers of the series to actually see the crews and settings. More New Frontier comics? While not top of my wish list I certainly wouldn't be disappointed to get another series, and reading it has wetted my lips for the series in general. If you didn’t pick up the series as it came out part by part the omnibus is out in October and well worth picking up for some engaging writing and brilliant artwork.